It took Kevin Harvick 17 years to return to Victory Lane at Atlanta Motor Speedway, home of the 2014 champion’s first Monster Energy NASCAR Cup Series victory. Harvick was dominate once again at the 1.54-mile track. The Stewart-Haas Racing driver led 181 of 325 laps as well as finishing almost three seconds ahead of second place, Brad Keselowski. Just like in 2001, Harvick held three fingers out the window of his No. 4 Jimmy Johns Ford to pay tribute to the late Dale Earnhardt. Harvick overcame early pit road problems when pit gun issues forced the driver to return to double check all the lugnuts before returning to competition. Harvick started the second stage of the Folds of Honor QuikTrip 500 in the 16th position on Lap 94. 32 laps later, Harvick passed teammate Kurt Busch for the lead. Jimmie Johnson brought out the first caution for an incident on Lap 160. The 7-time champion blew a tire that caused him to spin in Turn 2. The Hendrick Motorsports driver sustained significant damage to his Lowe’s for Pros Chevrolet. He finished in the 27th position, four laps down. Trevor Bayne blew an engine late in the event on Lap 297, leaving a cloud of smoke in his rear view. The smoke left rookie Bubba Wallace blinded, ultimately running into the back of Ricky Stenhouse Jr.
Five Fords finished inside the top 10. Brad Keselowski finished second, Clint Bowyer third, while Joey Logano and Busch finished sixth and eighth, respectively. Logano takes the series points lead after the second race of the season, six points over teammate Ryan Blaney. The Monster Energy NASCAR Cup Series head to Las Vegas for the first of three events on the West Coast on March 4, 2018. Martin Truex Jr. dominated in 2017, winning each stage, and passing Brad Keselowski in the final laps for his first Cup victory in Sin City. Don’t miss Truex attempt to defend his victory on Sunday, March 4th at 3:30 p.m ET on FOX. 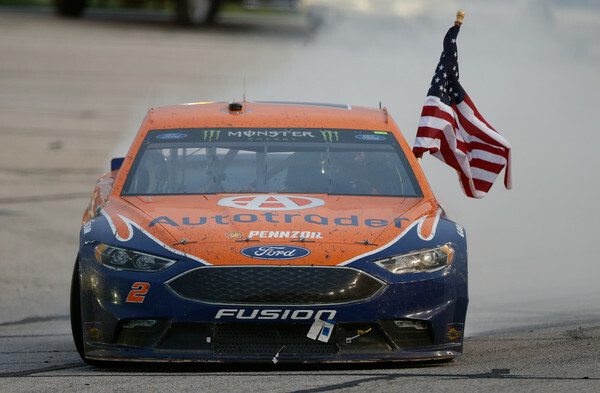 Brad Keselowski capitalized on others mistakes Sunday evening after battling his own to win the Folds of Honor QuikTrip 500. Keselowski was forced to pit late in the race after a team setback left the No. 2 Autotrader Ford restarting 13th, dampening their chances at a victory. But Keselowski was not to be denied. Keselowski maintained the track position he worked for despite pitting for fresh tires after a caution was thrown for Austin Dillon and Kevin Harvick was penalized for speeding on pit road. Keselowski passed Kyle Larson five laps later to score the 22nd victory of his Monster Energy NASCAR Cup Series career. Harvick dominated the event, winning both Stage 1 and Stage 2, before a costly miscalculation. Harvick was just one of the 13 speeding violations throughout the event. Chase Elliott, who paid the price on Lap 212, made a comeback for fifth place. While most drivers were being penalized for speeding on pit road, surprisingly, Joe Gibbs Racing’s Denny Hamlin was not. However, he suffered a rear end issue and finished 38th of the 39 car field. At the end of the day it was Keselowski with all the glory. He sits third in the standings after gaining five playoff points, while Harvick leads after two races.